Right from the moment the player enters the world of Fallout 3, they are forced to taste the bittersweet amorality of nature. Literally, as the player’s character is born the first words they hear are the last anguished breaths of their mother. Then, through a fogged over, blood flecked view of their father, they are wheeled out of the operating theater and into the future. Fallout 3 has an interesting spin the idea of the game tutorial. 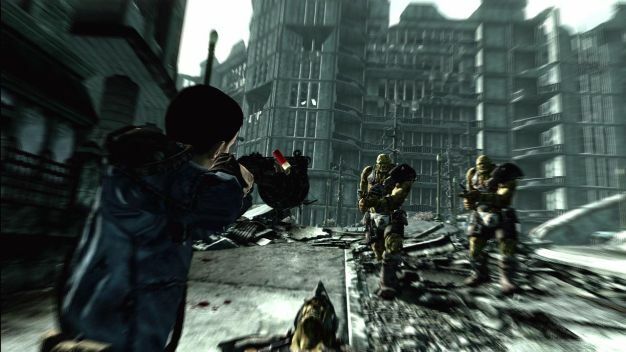 While they often mute the gameplay, limiting the character in their abilities for no reason which can be adequately explained through narrative, Fallout 3’s use of the main character’s childhood as a medium through which to introduce them to the game’s mechanics in stages as they develop as a human being is clever. Never once does it feel, at least through the first playthrough, that they are being held back by the game for the sake of a little nugget of information about this feature or that. Furthermore, the tutorial stages are incredibly linear and act as a superb contrast for when the character ultimately emerges from the vault for the first time. Aside from establishing systems of play, this prologue serves a second purpose – to introduce the relationship between the main character, their father and the vault. The refuge of those driven underground to escape a nuclear holocaust engulfing the world above, the vault should be a beacon of hope for mankind’s future. The truth however is far more complex. Presided over by a subtly tyrannical overseer, vault life is miserable and meaningless. The only ray of hope for the protagonist in their impoverished existence is the love they share with their father. The game establishes the significance of this pivotal relationship in a very interesting way. Upon beginning, and throughout the birth sequence, the player can make a number of choices determining things including (but not limited to) their name, gender and looks. While The game’s system of facial construction is functional, though not brilliant, the choices made at this stage will determine, in part, the looks of the father. This is a nice idea and establishes a visual connection between the two characters. However, it is fundamentally flawed in that regardless of the main protagonist’s race the father will still be skewed by his posh, British accent and quasi-Caucasian features. Which created imaginable problems as, for my first character, I created an Asian female. 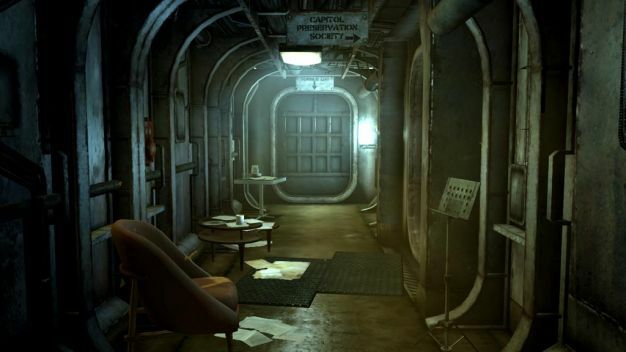 The prologue eventually climaxes with, by one means or another, the protagonist’s escape from the vault into the Capital Wasteland. It is recommended that the tutorial is played through a couple of times, simply because it is difficult to appreciate how many choices the player has early on and it is easy to feel as though the beginning has been somewhat rushed. From this point the doors are blown open. And the rest of the game takes the form of a series of quests and missions that, while they can be dipped in and out of casually, are likely to form some kind of logical sequence. Like so many other open world games, one major theme running throughout Fallout 3 is how the player establishes them self in the outside world. Again, like Grand Theft Auto, like Far Cry 2, the player is injected into a world that has no knowledge or experience of them and as such they must create a persona and a presence. In Fallout 3, this manifests itself in the form of Karma, a metaphysical reputation created by the moral choices you make and which in turn determines how the world reacts to you. Whether to attack that old guy or not, steal that gun on the table, murder that trader to get your money back. Being either naughty or nice will have both positive and negative repercussions (just as being neither will too) so it really is a case of how mean you want to be and nothing more. While the game has some elements or real-time, shoot-em-up combat, the game is an RPG through and through. So much more of how you shape your character through experience and personality “quirks” extend beyond simply fighting style or ability and as such the whole experience feels almost like an afterthought. Furthermore, the V.A.T.S. system – whereby the player freezes time to expend AP on specific shots at the certain parts of an enemy’s body – means that combat is something that is far more easy (and cost effective) to approach from a tactical, probability based angle rather than one relying on reflexes and hand-eye coordination. The world of Fallout 3 is stylistically brilliant. Neither a vision of an apocalyptic future of nor the 1950s, but rather a 1950s vision of an apocalyptic future (if that makes sense). The game is filled with all the Googie architecture and robotic companions that the 50s’ popular consumer believed they would be living with by the end of the century. The parade of bric-a-brac products and brands that are so typical of 1950s’ America give the game a continual dark sense of humor and irony. There is something quite unnerving and surreal yet undeniably humorous about seeing the vast expanses of grey that form the Capital Wasteland dotted with a Coca-Cola (or Nuka-Cola – thanks copyright!) vending machine or the skeletal remains of a 1950 Buick Skylark. Whilst the Capital Wasteland is conceptually a work of art, it is poorly executed. It is hard to shake the feeling that Bethesda really went to town with the old Ctrl-C and Ctrl-V in producing the wastes. Granted, it is a wasteland, not a theme park – however there seems to be little or no connection between locations, where as you might imagine that there would be. The result is that the world really does feel like a collection of genuinely interesting locations scattered about a meaningless sea of grey, rather than a domineering landscape that forms together into a single integrated, if disparate, whole. 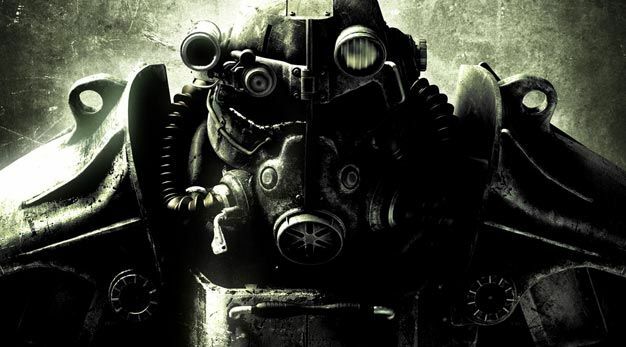 Fallout 3 further falls short in terms of visuals. Graphics are not the be all and end all, of course, and any open-world game will always come at a cost to visual fidelity. However, it is such a shame to see Bethesda’s brilliant ideas rendered in such a messy way. Character animation (for both NPC’s and protagonist) is poor by anybody’s standards and the game is littered with more little graphical blemishes and scars than the Capital Wasteland itself. It is important, however, to not take too narrow a view of the game. For all its little flaws it must be remembered that the scope of what Bethesda is trying to realize is tremendous. On all levels the game is vast, wild and at the player’s whim. If you invest time in the character and the world, all the imperfections listed above can quite easily become just superficial little nothings that you wish reviewers didn’t even care about anymore. In this case, it is almost impossible not to become engrossed, enthralled and pulled into the vast, gray, oblivion of Fallout 3. Brilliantly imagined and stylized aesthetic really encapsulates the surreal psychadelic fear of the 1950s. Deep and meaningful character development empowers the player. World that is as deep as it is expansive make for a consuming and thoroughly enjoyable experience. Messy visuals mean many good ideas are poorly realised. Slightly redundant real-time combat system.